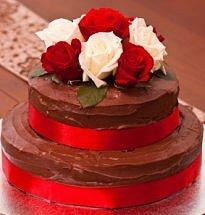 Chocolate and roses are classic choices for a Valentine wedding cake. 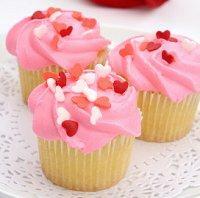 Valentine's Day is a popular wedding date and isn't complete without a good choice of wedding cakes. A sweet, decadent Valentine cake is a must on this most romantic day of the year to celebrate your nuptials. Whatever the reason for choosing a Valentine cake, there are many design options couples can use to create a personalized, romantic wedding cake. There are two considerations a couple should make when picking a Valentine's Day dessert for their wedding day. First, what classic symbols do they want to use, and second, how can they adapt those symbols for a beautiful and unique wedding cake. While these symbols may seem predictable, there are many ways couples can incorporate them into personalized, elegant wedding cake designs perfect for their celebration. Couples can also choose to offer these alternative sweet treats as wedding favors, add them to individual place settings for fun decorations, or simply include them in a buffet meal at the reception. 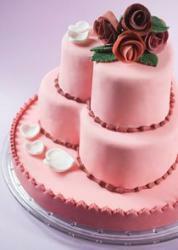 While a Valentine wedding cake may seem like a cute, romantic idea, it is important for couples not to overdo a theme. Well placed colors and understated decorations will be elegant and romantic without being overwhelming, while adding too many cute touches could make the décor sickeningly sweet. A simple wedding cake design with subtle Valentine touches will be perfect for any event without being too cutesy. 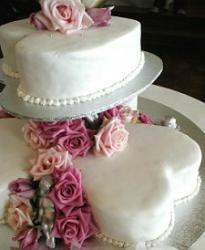 Valentine Day wedding cakes can be fun and whimsical or classy and elegant. By using treasured holiday symbols and creating a cake design that is both classic and unique, couples can celebrate their special day in a sweet way as they vow to always be Valentines.